The Musée Héritage Museum Archives acquires and preserves archival material significant to the memory of St. Albert and area. The archival holdings include over 100 metres of material including personal papers, oral histories, municipal records, business and community organization records. The material includes thousands of photographs, negatives and slides as well as ledgers, manuscripts, letters, maps, cassette tapes, videocassettes and digital files. 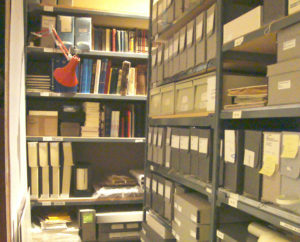 Archival holdings are rare, original and unpublished, so much care is taken to preserve the material. The archives is also in the process of digitizing its holdings so the material can be more easily accessible to the public. In addition to the archives, the Musée Héritage Museum has a special library. This library consists of over 1000 books that are unique to the history of Alberta and St. Albert. The books are non-circulating but available for reading at the museum. View information on the collection of artifacts and archival materials from the Weiller & Williams Co. Ltd.